As part of the process of writing a book for readers’ advisory librarians about how to work with genre blended books, I accumulated a huge list of titles that would never fit in a print reference. I didn’t want to just chuck them in a folder, though. These were good books! Around the time I finished writing the book, I also left my previous library job to move with my husband to sunny SoCal. This left me with time on my hands and an undiminished desire to help people find great books. I decided to start a website. I figured it could have two parts to start, a blog where I could review books and pull together lists of genre blends and trends and an interactive database of genre blended books. The blog was started in May 2014 and the Blender database launched about a month later. As a book reviewer for a print publication I am lucky to receive review copies of many new books from publishers. However, for many of the lists and reviews I write for the blog I am just as interested in older titles as I am the hot new releases. For reviews I will try to include where I got a book (purchased new, purchased used, library, publisher provided) whenever I can remember! Hard to say. As most of my reviewing energies are consumed by the people who pay me to write for them, I am pretty limited in how many titles I can review on the blog. If you would like to have your book reviewed at Genrify.com or included in the Genre Blender, you can contact me (see below). The Blender is a tool meant to help readers find books that include more than one genre. 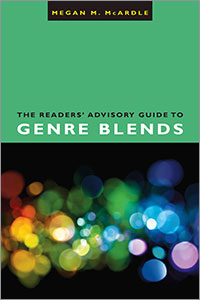 Using the Blender is easy — simply pick two or three genres you are interested in and click the “BLEND” button. Your results will include any title from the database that has the genres you selected. If you look at the results, you will notice that some genres will appear in ALL CAPS. This means that the genre is very prominent in the blend. Other genres might be listed in lowercase letters. This means that the genre is a part of the book, but not dominant in the story. The database, currently numbering over 500 titles, is not meant to be a definitive list of every blended genre title. Indeed for some popular blends like “Mystery” and “Historical Fiction” there are hundreds of titles in print. Instead, I hope to give some examples to give readers a starting point in exploring the blend. Some are personal favorites, some are popular titles. If part of a series, I usually included only the first book unless a later title is a better example of the blend. I hope to keep growing the database and improving the interface, so keep checking back for updates. My name is Megan M. McArdle, and I am a librarian with close to 20 years of experience in collection development and readers’ advisory service. Currently I am a collection development librarian for the Library of Congress, working at the National Library Service for the Blind and Physically Handicapped. I have managed Adult, Teen and Collection Development at the Berkeley Public Library in Berkeley, CA and before that I was the Director of Collection Development for the Chicago Public Library. My MSLIS is from the University of Illinois (Urbana-Champaign). I am currently the Science Fiction and Fantasy columnist for Library Journal magazine, and my book of genre blends was published by the American Library Association October 1, 2014. You can order it from ALA here: http://www.alastore.ala.org/detail.aspx?ID=11161 or at Amazon . Questions and feedback? Feel free to email me at megmcardle(at)gmail.com. (replace “at” with @ if you are not a spam robot). You can also find me on twitter @megmcardle. The link to the Genre Blender is currently broken and giving a message “502 Bad Gateway” — is this just a temporary glitch? I am hoping this wonderful resource is not going away!! Fingers crossed. Just a momentary outage due to a server upgrade by our provider.